Under Capricorn may be an Alfred Hitchcock film you’ve never heard of, but it’s an Alfred Hitchcock film you need to see. Though it’s not one of his best, this Gothic thriller set in 1830s Australia is better than its reputation, and thanks to a brand new 4k restoration courtesy of Kino Lorber, it looks better than ever. 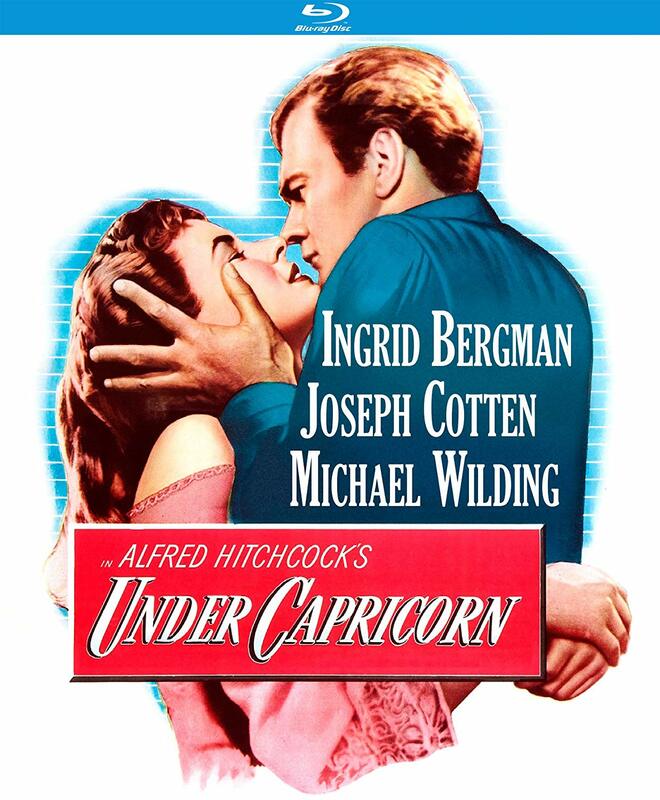 Unless you’re a diehard Alfred Hitchcock aficionado, you might not be familiar with Under Capricorn. There are a few good reasons why. Produced independently in England in 1949, this Gothic costume drama laid a massive egg at the box office and stands as one of the director’s most obscure, puzzling, and maddening films. Hitchcock himself harbored very mixed feelings about the movie, and was always quick to accept blame for the myriad problems that plagued the production. Though Under Capricorn was a definite departure for the Master of Suspense (mainly because there’s no suspense for the first two-thirds of the picture), it ends up a far more fascinating film than its lukewarm buzz would lead us to believe. Talky, dull, statically shot, and seemingly aimless for well over an hour, Under Capricorn suddenly picks up steam about 45 minutes before its conclusion, as simmering tensions bubble over, revelations jumpstart the plot, and moral dilemmas torture the characters. In the blink of an eye, I went from feeling like Rhett Butler at the end of Gone with the Wind (“Frankly, my dear, I don’t give a damn”) to becoming fully invested in every aspect of the film. In fact, the last act so totally captivated me, I’m eager to see Under Capricorn again, so I can better appreciate the build-up to the climax and absorb the telling nuances so deftly sprinkled throughout. Though Under Capricorn left American audiences and critics cold, it captivated the French. In 1958, the soon-to-be highly regarded Cahiers du Cinema magazine named it one of the ten greatest movies of all time. That’s right… of all time. While I (highly) doubt Under Capricorn would remain on that list were it composed today, its appearance six decades ago does inspire a more discerning look at this largely dismissed film. Set in Sydney in 1831, Under Capricorn chronicles the Australian odyssey of Charles Adare (Michael Wilding), a sophisticated, opportunistic young Irishman looking to make a quick buck in the frontier territory of New South Wales. Against the advice of the newly appointed governor (who is also his second cousin), Charles pursues a lucrative business deal with the brooding, notorious nobleman Sam Flusky (Joseph Cotten), a former convict who has amassed a sizable fortune after serving a seven-year sentence for murder. Charles soon meets Sam’s wife, Henrietta (Ingrid Bergman), a frail, confused woman with an alcohol problem, and at first, he pities her. Yet his sympathy soon turns to affection, as Charles tries to bolster the confidence and self-esteem of the insecure woman who seems strangely bound to her distant, disparaging husband. All, however, is not as it appears, and as secrets are slowly revealed, a clearer picture of life at the Flusky estate emerges. With that clarity comes desperation, heightened tensions, danger, fear, and legal jeopardy, all of which align to create a perfect Hitchcockian storm. While that storm takes a long time to brew, when it finally hits, it wields the power of a hurricane. Elements of other, better known and better executed Hitchcock films like Notorious, Suspicion, and most notably Rebecca permeate Under Capricorn and infuse it with a sense of déjà vu. Watching Bergman’s insecure, nervous Henrietta strive to assert her authority over the mansion’s staff and escape the strangulating grip of Milly (Margaret Leighton), the frosty Mrs. Danvers-like domestic who imperiously rules the roost, recalls Joan Fontaine’s tremulous heroine in the Daphne du Maurier classic. And while Cotten’s Sam lacks the dashing refinement of Laurence Olivier’s Maxim de Winter, they share a similar mental anguish and dark past. Unfortunately, the double whammy of a verbose script with far too much exposition and lack of cinematic artistry (did I just say that about a Hitchcock film?) sabotage Under Capricorn during its interminable first 75 minutes. In his previous film, the gimmicky Rope, Hitchcock seamlessly strung together a series of long takes to create the illusion of a single-take movie. His fascination with that drab, stagy process continues to a lesser extent here. The takes are shorter, running six to seven minutes instead of eleven or twelve, and his camera is more fluid as it follows the actors down long hallways and smoothly navigates the two-story set, but the end result is still viewer fatigue. Good editing keeps the brain engaged and stimulated, but no editing combined with lengthy and meandering dialogue scenes induces a fair amount of squirming. Once Hitchcock revs the film’s engine and returns to his bread-and-butter style of suspense moviemaking, I squirmed no more. Too little too late? Maybe for some directors, but not Hitchcock. Like so many of his heroines, Hitchcock rescues Under Capricorn at the eleventh hour, and the save is dramatic enough to make us (almost) forget what we had to endure to get there. Bergman, appearing in her third and final Hitchcock film, looks ravishing in Technicolor and exhibits appropriate intensity as the neurotic damsel in distress. However, she’s supposed to be Irish, and the lack of an accent amid many references to her character’s heritage, somewhat cheapens her portrayal. Interestingly, Under Capricorn would close a significant chapter in Bergman’s career. Shortly after shooting wrapped, she left her husband of 12 years and formed a personal and professional alliance with Italian Neo-Realist director Roberto Rossellini, which would spawn six films, three children, and a humdinger of a scandal that would lead – unbelievably – to an official condemnation of her morality and character by the United States Senate! (Oh, how times have changed!) It would be seven years before she returned to Hollywood. Cotten seems uncomfortable as the brutish Sam, never quite exuding the imposing, threatening air the role requires. (Original choice Burt Lancaster probably would have been better.) Yet both Wilding and Leighton (who would marry in real life 15 years later) supply welcome sparkle, enlivening the film with devil-may-care and devilish performances, respectively. Although Wilding is perhaps best known today for being Elizabeth Taylor’s second husband, he was a fine actor with an easygoing air, and Hitchcock would use him again the following year in Stage Fright. While I can’t think of any movie that doesn’t benefit from multiple viewings, Under Capricorn is one film that definitely needs to be seen more than once to fully appreciate its slow-burn narrative, numerous subtleties, and meticulous construction. Like most Hitchcock movies, there’s much more to it than initially meets the eye, so don’t let the sluggish start put you off. Though Under Capricorn never will be considered one of the great Hitchcock films, and many probably wouldn’t even call it a good one, it’s definitely underrated and deserves more attention. Give it half a chance and I think you’ll be impressed by it, too. Under Capricorn benefits from a 4k restoration that breathes new life into this 70-year-old classic. Presented in a 1.33:1 aspect ratio, the vibrant, detailed 1080p/AVC MPEG-4 transfer from Kino Lorber maximizes the impact of Jack Cardiff’s lush Technicolor cinematography. Cardiff won a well-deserved Oscar the previous year for his work on the breathtakingly beautiful Black Narcissus, and his expertise amps up this film’s allure. All the hues pop, but reds are especially bold and pastels look lovely. Evident but well-integrated grain lends the image a distinct film-like feel, costume textures come through well, patterns remain stable, blacks are dense, whites are crisp, and close-ups look appropriately glamorous. Unfortunately, the picture errs on the bright side, appearing a little washed out at times, and a fair amount of nicks and marks sully the print. A bit of image instability also afflicts one scene toward the end. Still, this is an impressive presentation of an independent production that probably hasn’t been well cared for over the years. Without a doubt, Under Capricorn has never looked better than it does here. The DTS-HD Master Audio 1.0 track initially sounds a bit sharp, but soon settles down and is fine overall. Though the musical score occasionally flirts with distortion, it fills the room with ease. Dialogue, however, often gets a bit muddled, with some exchanges difficult to understand. No age-related hiss, pops, or crackle intrude, which is especially good news considering the soundscape’s largely sedate nature. Special features include reversible cover art, an amiable and informative audio commentary by film historian Kat Ellinger, a revealing audio excerpt from the legendary Hitchcock/Truffaut interviews, a 2006 French-language featurette on Hitchcock featuring the impressions of author and filmmaker Claude Chabrol (who famously praised the director with the words “Form does not embellish content, it creates it”), and the film’s original theatrical trailer. Previews for other Hitchcock, Bergman, and Cotten films released by Kino round out the extras package.